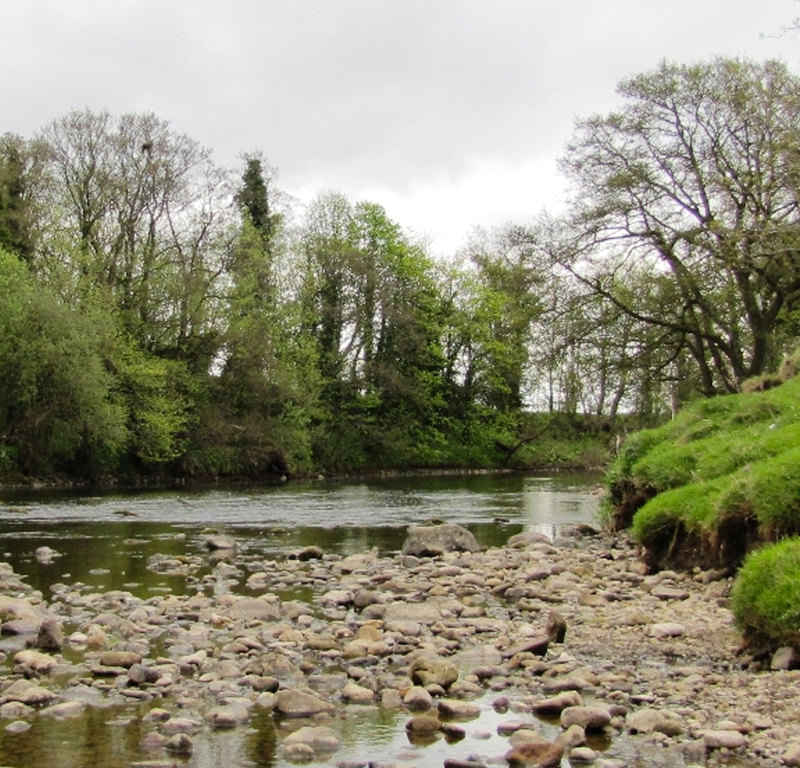 Black Swan, Fearby to Masham – 2.5 miles About one hour’s walking time with the option to return via Marfields gravel pit nature reserve, a total of 6 miles, about 3 hour’s walking time. From the side of the Black Swan walk down the caravan field to the fence at the bottom. At the fence turn left and go over the stile in the corner of the caravan field. Cross the next field to the stile in the hedge opposite. Cross the stile and walk along the edge of the next narrow field with the hedge on your left to the stile in the corner of the field. Cross the stile and continue along the edge of the field with the hedge on your left until you reach the telegraph pole in the hedge. Walk across the corner of the field from the telegraph pole under the power line to the fence opposite. At the fence turn right and follow the fence for a few yards to a two plank footbridge over the ditch on the left. Cross the plank bridge and the stile after it. Over the stile keep to the left and follow the hedge to the gate in the corner of the field. Go through the gate and cross the next field to the gate in the left hand corner. Go through the gate and cross the next field to the gate opposite. Go through this gate and follow the hedge round the edge of the field to the next gate. Go through the gate and cross the next field diagonally to the stile opposite. Cross the stile and the two plank footbridge after it. Cross the field diagonally to the stile between two large flat stone posts. Cross the stile and cross the next field to the stile opposite. Cross the stile and cross the corner of the field to the stile in the hedge. Cross the stile and turn left to follow the hedge to the stile in the corner of the field. Cross the stile onto a lane. this path round the corner of the field to a stile on the left about halfway along the side of the field. Cross the stile and follow the path along the edge of the field with the hedge on your left to a stile at at the end of the field. Cross the stile and continue along the edge of the field with the hedge on your left to the gate at the end of the field. Go through the gate and follow the track round the edge of the field with the hedge on your left to a gate at the end of the field. Go through the gate and walk down the slope to cross the field diagonally to the gate opposite. Go through the gate and follow the track along the edge of the field with the hedge on your right. At the end of the field is a stream with a post and wire fence on both sides. Immediately across the stream turn right and go through the gate ahead. Through the gate follow the hedge on the left around the edge of the field, past some barns where the hedge stops and is a post and wire fence begins. At the end of the field the track continues between two hedges and then passes an agricultural depot. On the left. From the depot follow the access road to its junction with Westholme Road. Turn right to walk along Westholme Road round the bends to the back of Theakston’s Brewery. Immediately past the brewery turn left down an alleyway. At the end of the alleyway turn right and then left on to the main road. At the next bend in the main road turn right and enter the market square in Masham. 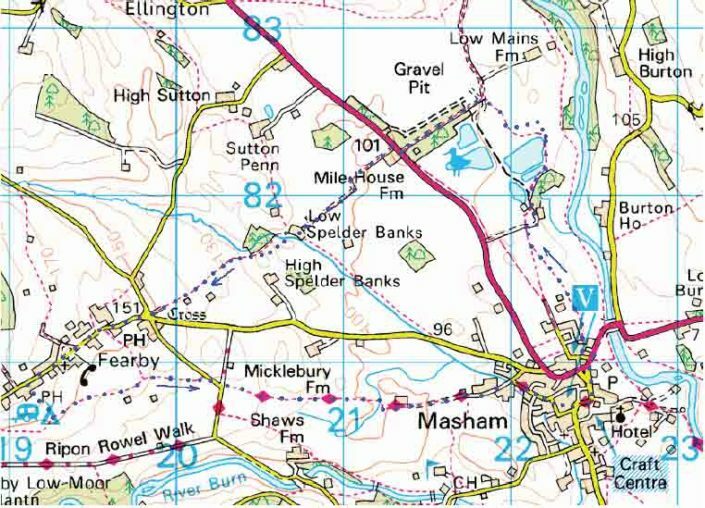 After your visit to Masham you can return to the Black Swan using the same route in reverse or you can use a route of about 3 miles via the Marfields gravel pits nature reserve. To use this route follow the guide below. From the Flag pole in the market square head for the road between the Bay Horse pub and the Bruce Arms pub. Follow this road down the hill to the junction with the main road to Ripon, A6108. At the main road head towards Ripon with the playing fields and river on your right. Just a few yards from the junction is a car park sign pointing down a track to the right. On the opposite side of the main road is a narrow tarmac road up the side of the Bank Villa B&B toward the back of the Black Sheep brewery. Go up this narrow road and at the end of the stone wall on your right turn right to cross a car park to a finger post footpath sign in the corner. Follow the path from the sign along a ledge behind some housed with the Black Sheep Brewery on your left. After the brewery there are some houses on the left. Follow the path to a stile in the fence at the end of the houses. Continue across the field along the edge of a bank on the right. The path follows the top of the bank and drops down to a gateway at the far side of the field. Go through the gateway and follow the fence on the left hand side of the field. At the end of the field go through the next gateway, where there is no gate in place and continue with the fence on your left until the fence meets the top of a bank. Follow the top of the bank on your right with the fence on your left. At the end of the field the fence drops down to a gate with a house ahead and to the right. Go through the gate and walk up the slope to a stony track. Turn right and follow the road round to the left into the car park at the Marfields gravel pits nature reserve. Enter the reserve through the opening in the car park fence in the right hand corner and walk up the slope ahead to the large yellow sign which warns about a path closure in the nesting season. At the yellow sign turn right and follow the path round the edge of the reserve. 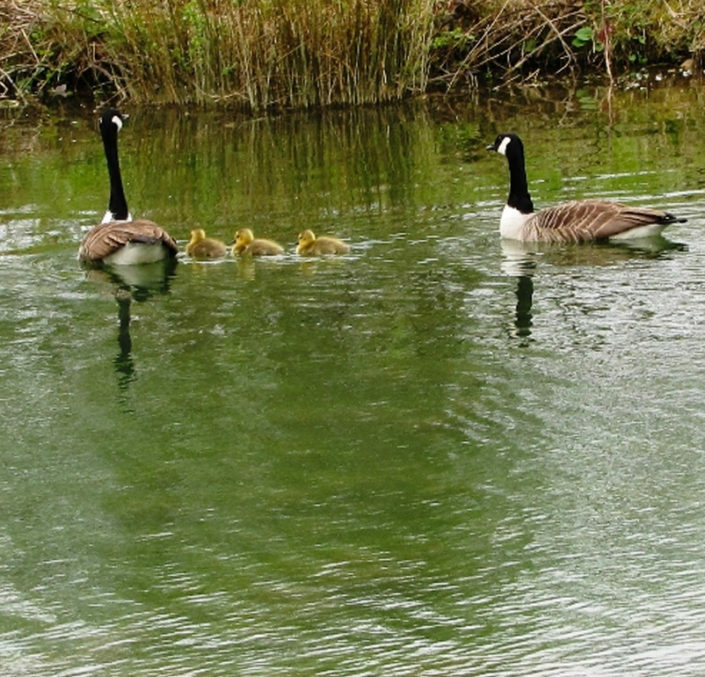 Continue past the wildlife observation hide and follow the path round the edge of the lake to the fence at the edge of the reserve. At the fence go through the pedestrian gate and over the stile on the right. Over the stile turn left and follow the fence on your left along the edge of the field to the next field gate. Turn left through the gate and follow the fence on your right along the side of the field. At the end of the field go through the gateway and down the small slope. Turn right at the bottom of the slope and walk along the edge of the field to the corner. Turn left at the corner and continue round the edge of the field. Ignore the field gate and continue to the next corner where you go through a pedestrian gate. Climb the slope ahead to the large gateway at the top. Go through the gateway on to an unmade road. Turn left to walk along the unmade road to its junction with the main road, about 600 yards. At the main road take care with the traffic and cross over. Turn right to walk along the grass verge for about 50 yards to a farm track on the left. Turn left on to the farm track and follow it round the bends for half a mile to a ‘t’-junction at a farm. Turn right at this junction to pass the farm on your right and go through the gate ahead. Walk round the edge of the field with the fence on your right until the post and wire fence becomes a hedge. road go straight ahead to join the road into the village. Follow the road through the village to the Black Swan on the left. * This part of the route is not shown as a public right of way on the map but on the ground it does seem to be the route that is walked. The public right of way follows this alternative route.